Yesterday, Mukesh Ambani revealed Jio's latest masterstroke - Jio Prime. Jio Prime is only valid for existing Jio users or those who get a new SIM activated on or before 31st March 2017, the day the Happy New Year offer ends. With Jio Prime, users will be able to continue enjoying unlimited data, albeit with a fair usage cap of 1GB/day by shelling out Rs 303/month. This offer will be valid until 31st March 2018 and effectively works out at Rs 10/day or Rs 10/1GB of free data daily. To become a Prime customer, a user has to pay a flat entry fees of 99 rupees. Thus for 12 months, it comes out be Rs 3735 for 365GB of data. 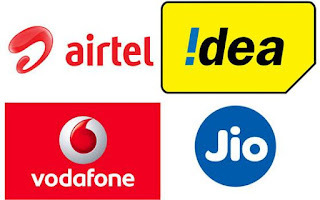 Ever since its launch, Jio has completely shaken up the market and pushed competitors like Airtel and Vodafone to dramatically lower their rates and introduce new plans and offers in order to remain relevant in the marketplace. Let's see how the rest of the competition stacks up against Jio's Prime offer. Airtel has a Rs 1495 plan that gives users 30GB of data for 3 months, effectively giving users 10GB of data at 500 rupees per month. A Jio Prime user in the same time frame will get 90GB of data for Rs 909. The only advantage that the Airtel offer has is the fact that Jio has a 1GB per day fair usage cap after which the speed gets reduced to 128kb/s while an Airtel customer can choose to use as much of their free data in one day. Airtel has also introduced two unlimited voice calling packs at Rs 145 and Rs 345. The former offers unlimited Airtel to Airtel voice calls along with 300MB of 4G data while the latter offers unlimited local/STD calls to all operators and 1GB of 4G data. Both plans have a validity of 28 days. Vodafone has a Rs 297 plan which gives a user 4GB of 3G data with a validity of 28 days. Similar to Airtel, Vodafone also offers two free voice calling plans. The first, at Rs 149 offers unlimited Vodafone to Vodafone voice calls along with 300MB of 4G data. The second, at Rs 349, offers unlimited local/STD calls to any operator along with a gigabyte of free 4G data. Both plans have a validity of 28 days. For Rs 297, Idea customers can get 3GB of data with a validity of 28 days. Idea also has two voice calling plans. The cheaper plan gives 300MB of 4G data along with unlimited Idea to Idea calls at Rs 149 while the more expensive plan offers 1GB of 4G data alongside unlimited local/STD calls to any operator at Rs 348. Jio has a Rs 299 plan which offers 2GB of data per month along with unlimited local/STD voice calls and SMS with a validity of 21 days. If we go a step higher, Jio's Rs 499 plan offers 4GB of 4G data along with unlimited local/STD voice calls and SMS with a validity of 28 days. If we include Jio's Prime service into account, no other operator can even come close to offering a better deal for the price. Only Airtel comes close with its Rs 1595/3 months offer, which still offers 50GB less data per 90 days at a higher cost. However, for users getting a Jio SIM after 31st March 2017 and hence not having access to the Jio Prime service, the situation becomes a little bit more complicated. Jio has a 499/month plan which offers 4GB of free 4G data, unlimited data between 2am to 3 am at night, free local/STD calls to any operator as well as unlimited SMS. However, as mentioned above, Prime subscribers can avail the Rs 303/month plan which will offer 1GB of 4G data per day till 31st March, 2018. Airtel's Rs 549/month infinity plan offers 3G of free 4G data, free local/STD calls to any operator and 100 SMS/day. Airtel is also offering up to 10GB of additional free data at a nominal price of Rs 100 per month to its existing post paid users.This offer is only valid for a limited time however. Vodafone's RED 499 plan offers 3GB of 4G data, unlimited local/national SMS, free local/STD calls to any operator along with free national roaming incoming calls. Idea's Rs 499/month unlimited plan provides 3GB of 4G data, free local/STD calls to any operator along with 100 SMS/day. As a result of Jio's disruptive pricing, all operators now offer extremely similar postpaid plans. Jio offers the most amount of data at 4GB compared to the 3GB offered by the other operators. Also, both Vodafone and Jio offer unlimited SMS while Airtel and Idea have a cap of 100 SMS/day. Obviously, none of these plans can compare to the sheer value offered by Jio's Prime service but to avail the same, a user will have to either be an existing Jio customer or get a new Jio SIM activated on or before 31st March 2017. What must also be taken into account is the fact that Jio introduced their plans way back in September before all operators lowered their rates. It wouldn't be surprising if Jio overhauls their plans in the near future to offer even better value for money. All in all, despite all the controversies, Jio's entry has been great for the competition. According to the fundamental laws of capitalism, the more the competition, the better it is for the end user both in terms of pricing and quality of services.